A fear of holes. Does it paralyze you? When you see a swarm of jutted holes. Each crater, each dent, each void glaring in front of you. Orifices opened out of it. Pores pouring into you. It desecrates you. It defiles you. It disgusts you. The horde clusters for you. Let it infect you. So let me ask you again. 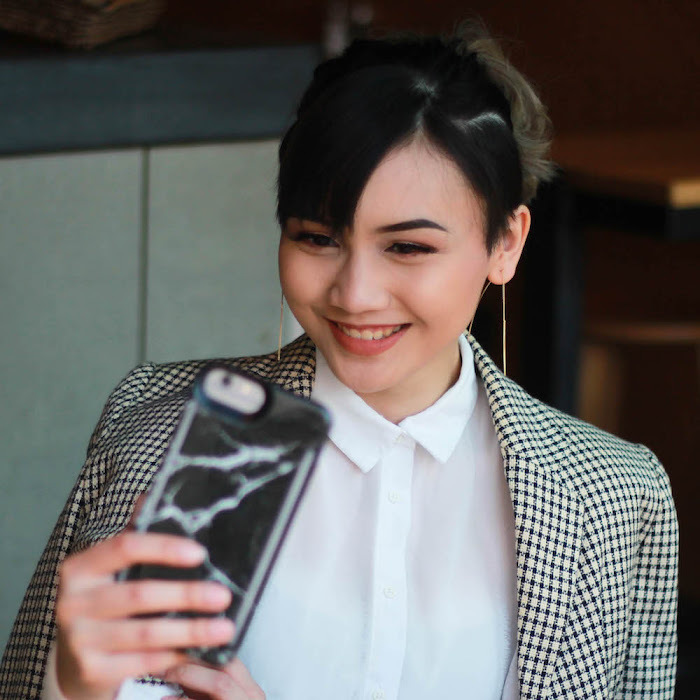 Do you have Trypophobia? Trypophobia is apparently a recent phenomenon. An irrational fear of clustered holes. It's not even considered a legitimate phobia. Yet still manages to engross and gross people. SciShow has a great explanation about Trypophobia here. Michael muses it might be a survival instinct or an emotional contagion. Whatever it is, it's disgusting. I have a strange fascination with Trypophobia. Like many people, a swarm of small holes averses me but I can't help to stare. My eyes glisten but my throat holds back a gag. It's a beautiful sight to behold. Even if it does make you grimace. You can't look away, you just stare. It incites an odd feeling, of excitement and horror. This is the first look of my Fright Night Series. 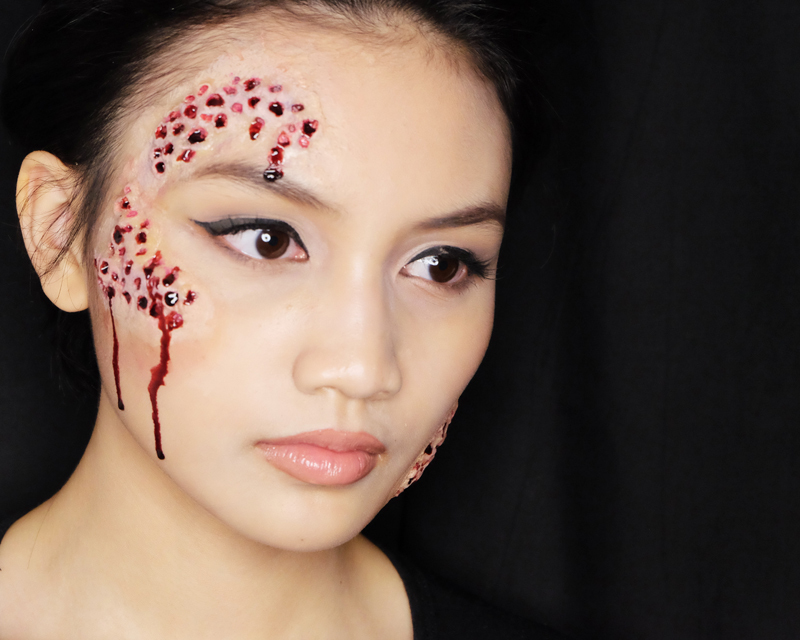 I've been planning to do a Trypophobia look for months now. I never did find the time until now though. Something came over though. After coming back home with my makeup still intact, I decided better late than never. October arrived and I shouldn't procrastinate. I set my makeup, and limited amount of Graftobian Scar Wax and started sculpting. It didn't take as long as I thought it would. About two or three episodes of Empire long. Once I finished the whole look, I revealed this look to baby sister. She claimed it looked like moldy cheese filled in jam that made her want to gag. What a sweet compliment. This is where I should explain to you how to achieve this look. I can't because I made it up as I went along. It's my first try so the makeup isn't smooth as I'd like it to be. I didn't have scar wax to spare. I'd definitely try to recreate it one of these days when my scar wax isn't limited. For now, I'm still quite proud of what I've done. Instead of explaining what to do, here are some helpful videos! Created by MadeYewLook and QueenKingSFX who helped me through the process. They give detailed information and clear instructions. Let me apologize if this disgusted you. Can I also say I hoped I succeeded in my intention of disgusting you? Hopefully, I'll be doing an SFX look once a week. Time will only tell if this won't take away from exams or vice versa. That's the real horror: exam. A shiver tingles down my back. 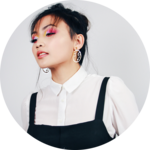 If you'd like to get some more inspiration for October, then you follow Hey Bash on bloglovin! Dedicated to the creepy crawlies and glorious gore for this whole month! Because Fright Night is the only time I get too! So what do you think of Trypophobia? Does it freak you out? yuck, the video is gross! So yes you succeeded! OMG this is so creepy! Wow you are so talented!! I would love to be able to do this for Halloween! Ugh, I fear no holes though. Great makeup. This actually looks really pretty! I know some people are saying it looks disgusting but i don't know why but the sharp red looks amazing with your hair, not to mention your eyeliner! This looks amazing and I'm not gonna lie this got my heart beating fast haha! Wow that looks amazing! I love all things scary and halloween related. That looks a little scary, but it is really well made, you're really talented! Totally freaks me out, but it's perfect for Halloween! Love it! I did not know about this fear until now. Bash, you recreated this scary look perfectly. Actually creeps me out a bit - Great Job! I must do a horror shot with this look! Thanks for sharing! You look amazing! I've never heard about this!!! The second video is so creepy ! Have a lovely day. I've also never heard of trypophobia so that's a new word into my vocabulary, thanks! I think I have slight trypophobia. You are probably the prettiest person I've ever seen with a swarm of holes 😂. Beautiful job. I would love to do this for Halloween! Incredible makeup but yes that terrifies me! LOL! That is amazingly done makeup, girl. Totally creepy and disgusting but that just proves how well it is done. You should be working in show biz & doing makeup for movies, Bash! Success! This really grossed me out. I would agree with your sister. Especially the one on the bottom jaw. Great job! 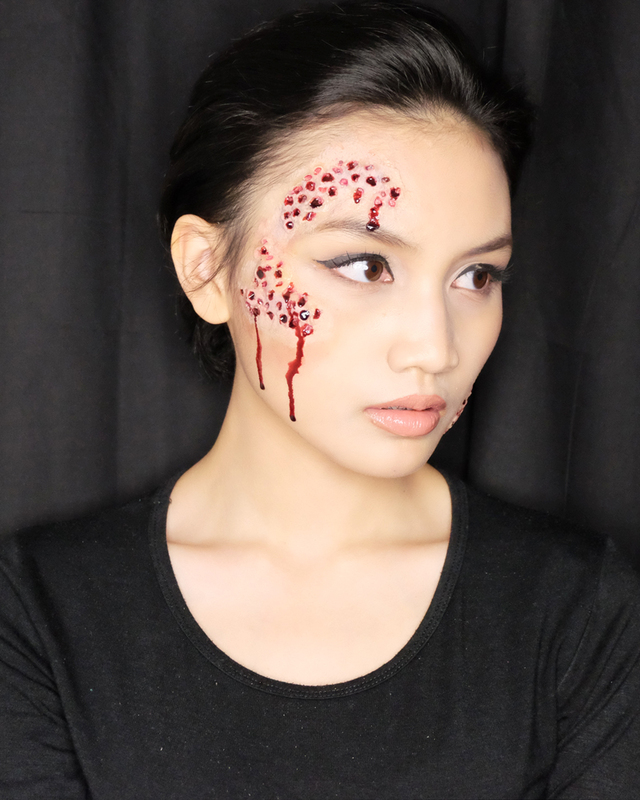 Oh, this "makeup" is just perfect for Halloween, Bash and what about your question, luckily I haven't got trypophobia. But on the other hand, I'm afraid of spiders! Eeek, that's disgusting for real, Bash! But somehow I can't stop watching at it... Haha! You've done an amazing job, Bash! Wow! Well you definitely succeed in grossing me out girl but great job, this looks very realistic. Oh my god! This is so creepy, I can't look away! Such a good halloween idea! IT LOOKS SO COOL (I mean apart from if someone did genuinely have it on their face, it would be a shame) But I can't stop staring! I so have this phobia and watching the video to the end was hard. It looks really cool though but would totally gross me out if I had to do it on me. You did a fantastic job, perfect time of the year too. It is totally gross but you are so talented at making it look disgusting. So interesting! And yes, I have to admit I'm a little bit freaked out :) But wow, you are so talented! Amazing job! But seriously, it looks so real! Omgosh I have to say the video grossed me out, I still have goosebumps!! Didn't even know about this Trypophobia! You did an amazing job with the makeup! So scared, yet looooving it! You are majorly talented Bash! can i just say how pretty you are?! gorgeous!! O.O the trick is well made, but yuck! Oh bloody hell! I didn't have a fear of holes but now I do! Jeeeez, are you trying to put me off your blog? :P Still, I will continue to admire your fabulous work and come back for that alone! It doesn't bother me but I've heard of it before! It really freaks some people out. Aw that's creepy... but didn't freak me out. You are really good in makeup! Great job! Oh wow, that is so realistic that it's freaking creepy! I wish I can do this for Halloween, it would freak the kids out. LOL! Hahaha your baby sisters comment was so on point although I'm not too sure whether to love or hate you cause you still look bloody beautiful! ;) *sorry couldn't help myself ha! 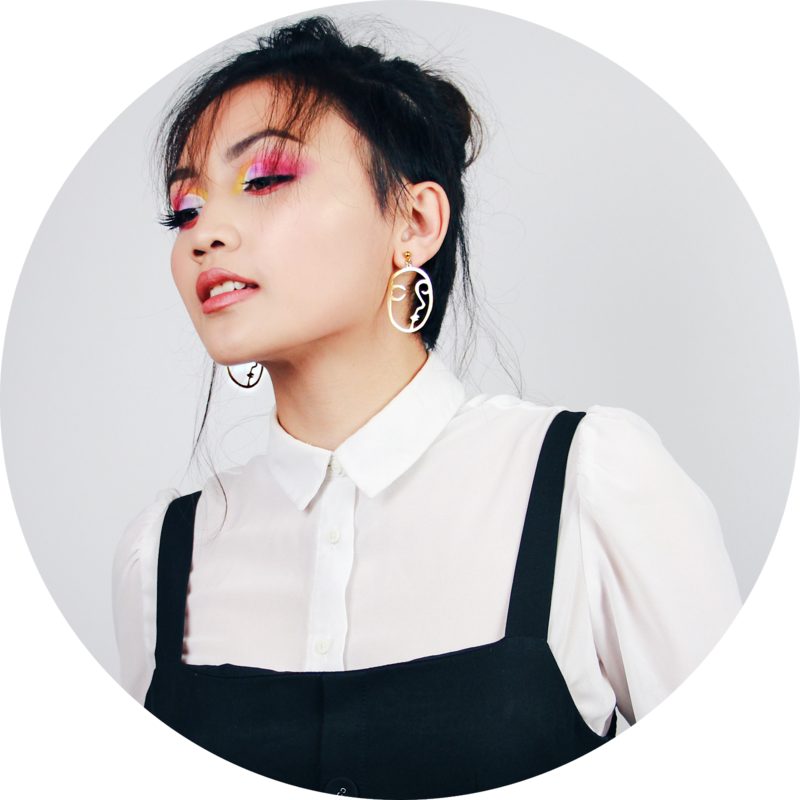 * You really nailed it though and I truly am so happy you are doing more makeup looks on your blog because you are one talented woman Bash! eeepp aahh!!! i don't like those!!!! Apparently I have Trypophobia because a bunch of small holes absolutely disgusts me, haha. This is so perfect for Halloween though! Awesome job! Wow this is such a great Halloween idea! You're really talented too, this is so well done. Well I didn't know that little holes scare me but now I do. This look is terrifying but you did an amazing job! The whole post was very interesting to look at and to read. Have a great Friday, Bash! This is so yucky! just kidding , you look gorgeous regardless! I actually have trypophobia! My bf finds me weird lol. Wonderful job with the makeup! Though, I think I do have trypophobia... Those pictures disgusted me! I tried to look at them to admire the work, but I couldn't do it for so long. I ended up covering the pictures with my hand so I could read the rest of the post... It even gave me shivers... Awful. And no, I'm not watching the videos... I might as well just watch the Saw movies if I do. But it was a great makeup job, really! Disgusting, but well-done. That would be a very cool Halloween look! Have to confess I'd never heard of trypophobia before! Ok, so not only is this very cool, but you got me googling Trypophobia, and now I'm both very curious/ slightly unsettled? I don't know why but... ah! Love this post, but it's definitely hard to look at. I think it's because I had a nightmare one time after seeing a photo with holes all over a woman's breast. It was obviously a photoshopped image, but seeing it freaked me out so much. Holes in the body = gross. I'm not fearful of it, just gross, haha. Holes in general = nah. The idea that just holes in general could cause discomfort/concern is really intriguing. For some reason I got a bit of wonder in the way that was described. And it made me think of the series 'The Looking Glass Wars Trilogy.' It's basically a fanfic about Alice in Wonderland. I love the series with all of my heart. The looking glass is a portal between "Wonderland" and the real world and often it can come in the shape of puddles in the ground. I made that connection immediately and I wondered for the person who would have this fear what a crater large enough to create a deep enough puddle would do to a person--especially on a rainy day. Wow, I'm so impressed!! That effect looks so cool! Wow this looks...gross but so fascinating! ! Fab! If only I could do this for Halloween, it would go perfectly with my "dead" theme. This creeps me out, beautifully done though and you're still pretty underneath it all. Yes, Bash! Yes! Great Look!!! I definitely held in an upchuck! This is soo cool Bash! Can't wait to see what you have in store for Halloween! 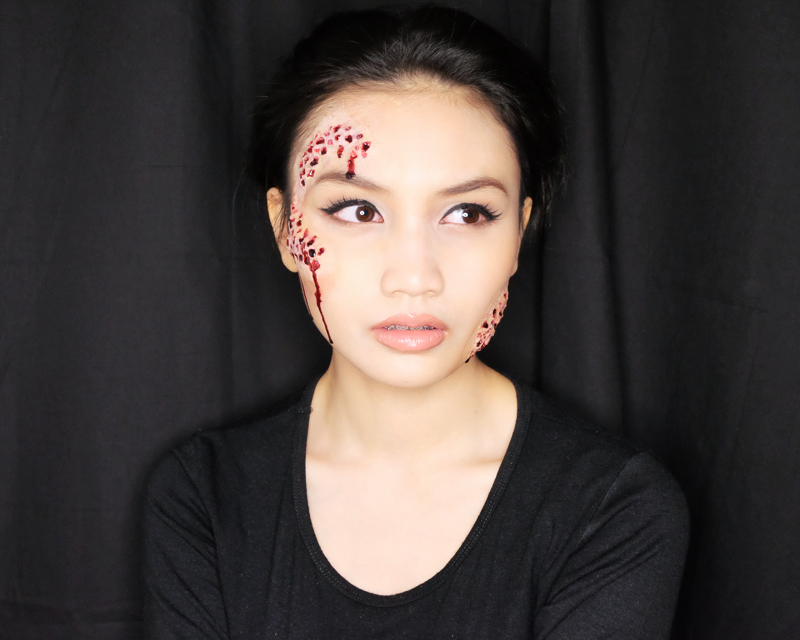 I'll be honest, I used to have trypophobia, but after 2 years of nursing, I'm so over it!